If the original Washington, D.C., Metrorail route for Arlington, Virginia, had not been changed, there would be no subway beneath Wilson and Clarendon Boulevards today. It's there because community leaders, planners, and residents successfully championed for a subway route following the area's old commercial corridor instead of along the Interstate 66 median. Since that decision more than four decades ago, the Wilson-Clarendon corridor has been rebuilt into a compact "urban village" with street-level shops, restaurants, nightclubs, and upper-story offices and residences. It is a place where nearly 20 percent of residents don't own a car and 50 percent walk, bike, or use transit to get to work. Established in 2000, the upscale art deco Clarendon Ballroom has stormed onto the Washington, D.C., event scene and has hosted some of the area's most memorable weddings, fundraisers, and events. Photo courtesy Arlington Economic Development. The history of these two boulevards — which meet in the heart of downtown Clarendon before continuing eastward and dividing into parallel, one-way streets — demonstrates how active local government and committed business owners and residents used planning and smart growth practices to take advantage of, and effect, change. The results — including above-average use of Metro, less reliance on automobiles, mixed-use development, increased density, and reduced carbon footprint — are some of the reasons APA has named Wilson and Clarendon Boulevards between the Court House and Clarendon Metro stations among the Great Streets in America for 2008. The early story of these two boulevards is similar to that of many urban streets elsewhere in the country. The streetcar's arrival in 1896 brought shoppers to Clarendon in droves and, over time, led the streets to become part of what was considered Clarendon's downtown. With construction of the country's freeways, including I-495 — the D.C. metro area's "Capital Beltway" — the exodus of businesses and households from Clarendon to newer suburbs was hastened. With Metrorail's Orange Line service beginning beneath the two boulevards in 1979, planners turned to developing a series of sector area plans for each of the five Metro stations in Arlington. The first sector plan for Clarendon was approved in 1984 and followed by revisions and updates in 1990 and 2006, respectively. 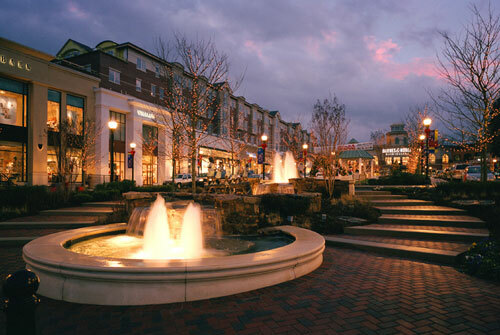 The first major development built on Clarendon Boulevard following the sector plan was Market Commons in 1999. In addition to its stores, Market Commons includes townhouses and luxury apartments. Outdoor fountains, soft music, benches, and a playground attract people of all ages. Residents from Market Commons also can shop for organic produce and baked goods at a farmer's market at the Clarendon Metro station. 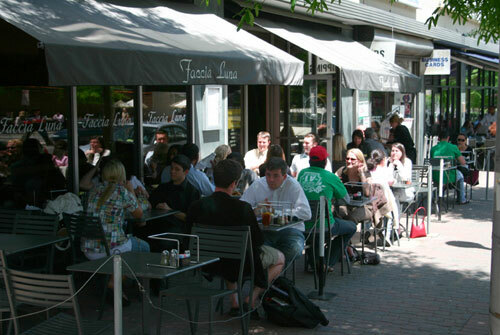 Diners enjoy the spring weather on outdoor patios along Wilson Boulevard. Photo Courtesy of Arlington Economic Development. One of many historic structures that have been preserved along the two boulevards is the 1939 Underwood Building. Typical of the streamlined Moderne style popular in Arlington County at the time, this structure and the Old Dominion Building are part of a larger project known as the Clarendon Center. As "complete" streets designed to accommodate not just motorized but also non-motorized users, Wilson Boulevard has experienced a nearly 16 percent drop in traffic from 1996 to 2006, and Clarendon Boulevard has seen a modest, four percent increase during the same period. Bike lanes on Clarendon and Wilson boulevards connect to nearby Metro stations, and sidewalks continue to be widened to accommodate increasing numbers of pedestrians. The 2006 Clarendon Sector Plan envisions the development of 1.1 million square feet of new offices, including "creative class" space: nontraditional offices with character or historic charm for firms whose culture embraces the offbeat. As office workers flock to the boulevards for lunch, snippets of conversations in other languages can be heard. One in five residents is foreign born and one in four speaks a language other than English at home. The boulevards are known for their ethnic restaurants, particularly Vietnamese, and their nightlife. 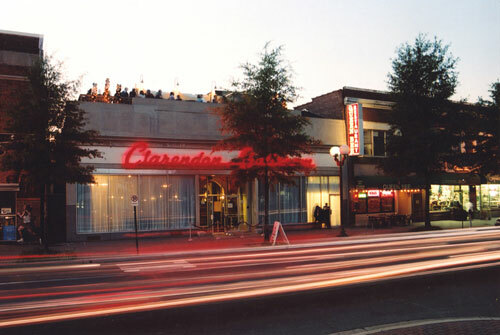 "We see everyone from all walks of life and all ages because [Clarendon] has a little something for everyone," says Jonathan Williams, a co-owner of Clarendon's Restaurant 3. "There are a lot of business owners around here who live and work here. We care about the little things. We care about the personality of the neighborhood." The Market Common provides a public space for shoppers in the surrounding complex. Photo Courtesy of Arlington Economic Development.